During one of my regular scans of Kickstarter for new backpack campaigns, I noticed the Switch by WiWu. It recently funded with 99 backers pledging $11,740 USD to help bring it to life. I’m a little surprised that this didn’t have more interest as this looks like a great value pack for well under $100. If you like the look of the pack I’d recommend keeping an eye on the Kickstarter page for further details of how to purchase. In a similar vein to the Everyman Hideout 5 Way, the main selling point of this bag is its versatility. It switches easily into four different modes (shoulder bag, handbag, messenger bag, and backpack) thanks to a variety of zippers and it’s detachable straps. First impressions are that this looks like a neat and useful day/overnight pack. I am a big fan of the understated look and the addition of a cross body bag and storage case, both which pack into the main compartment, make this a great value option. It should be noted that the regular retail price is due to be around $150USD. The exterior of the Switch is very clean. There’s a single zipper pocket on the front and flipping it around will reveal the straps and sleeve for slotting over the handle of your roller suitcase. There are also two looped carry handles — one on the top and one on the side. Another notable addition on the exterior is a simple reflector strip for added visibility — a nice touch. Finally, you’ll notice a cord pass through on the top of the pack, ideal for headphones or a cable leading to a phone battery charger. The detachable straps also serve as an anti-theft device. To quickly secure your bag to any fixed object simply uncouple the strap, loop it round sand reconnect. Many of the packs I review on this site feature the clamshell opening (I am a fan) and the Switch is no exception. This pack holds 22 litres and, I’d suggest, hold enough for a couple of nights away. As you can see from the campaign video it packs a lot in addition to work essentials like laptop, notebook, phone etc. Internally there are two compartments. The main packing area can be sealed with two flaps secured by velcro. This is a nice change to compression straps and it looks pretty sturdy. This section also features a shoe bag accessible from the bottom of the pack. The opposite side has two mesh zipped pockets ideal for EDC items. In addition to the main packing compartment, there’s a tidy little pocket for your notebook and pens and a padded cell for your laptop. These are both easily accessible via their own zippers on the exterior of the pack. In addition to the main pack the Switch ships with two additional bags both of which fit neatly into the main compartment. 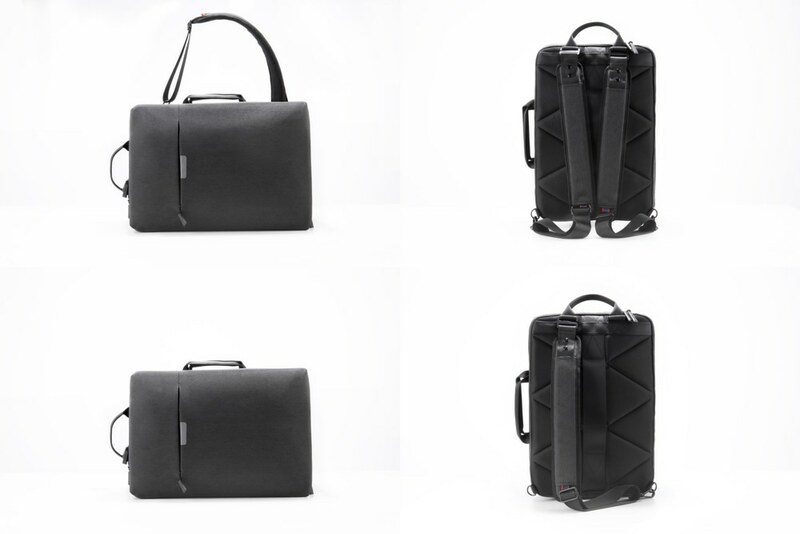 The cross body bag looks like a mini Switch and is intended for holding everyday items when traversing the city. You can slot it over your head and keep it in easy reach on the front of your body. The storage case can act like a Dopp kit or tech pouch. It’s nice to see these included in the already competitive price. 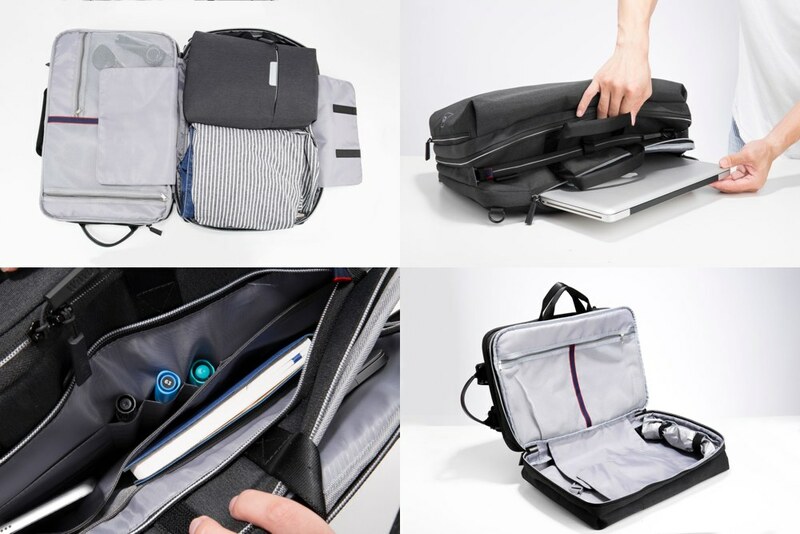 If you like the look of the Switch then you might also like the WiWu OnePack backpack which has raised in excess of $325,000 USD over both it’s Kickstarter and Indiegogo campaigns. As mentioned before I am a big fan of neat, branding free, black/grey packs and this is no exception. This style, i.e. clean and versatile, and size seems (20–25 litres) to be increasingly popular and I expect to see more packs in this vein appearing. Find out more about the WiWu Switch on Kickstarter.